Creamy, healthy and so delicious! 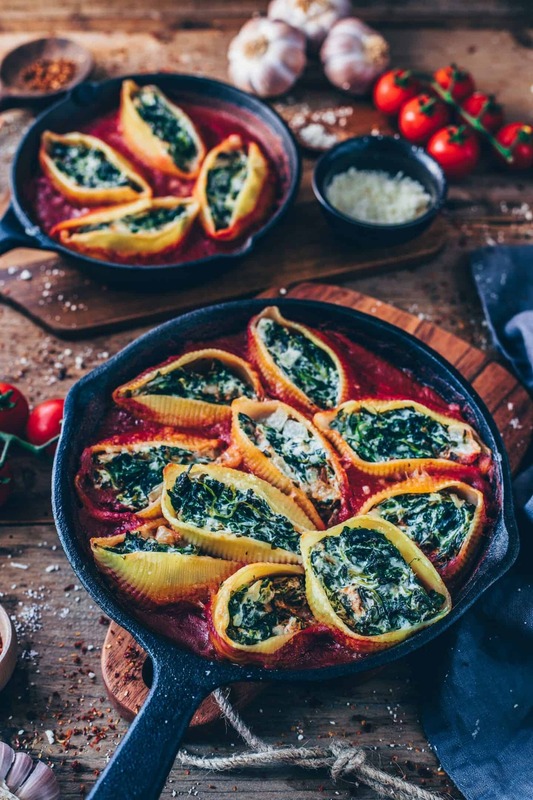 These Vegan Stuffed Shells with Spinach and plant-based Cream are the ultimate comfort food. Do you sometimes want to try a new dish but you think that it might be too complicated to cook? Well, this recipe is very easy to make and you need only a few simple ingredients. I made this dish with organic wheat pasta shells but you can use gluten-free pasta shells, if you’re a gluten-free eater. I’ve also added fresh steamed spinach, roasted garlic, onions and homemade tomato sauce, so it tastes flavorful and contains vegetables. 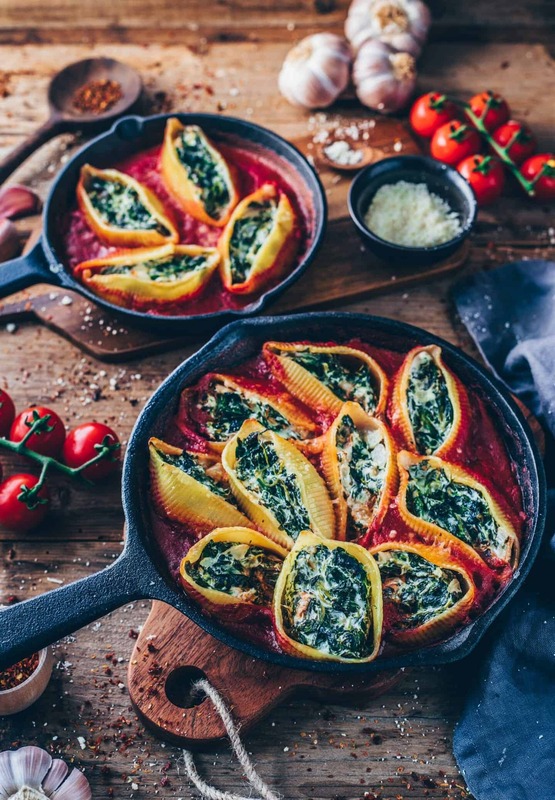 The filling for these vegan pasta shells is made of dairy-free cream, fresh steamed spinach and roasted onions + garlic which add tasty flavors. To make it, steam fresh spinach until collapsed, first. Then drain, squeeze with your hands and chop roughly with a knife. In the meantime, fry chopped onions and garlic. Next, mix everything together with cream. Season with salt, pepper and a splash of lemon juice (or other seasonings of choice) to taste. That’s it! If you don’t have fresh spinach, you can use frozen spinach. Simply defrost and then squeeze. You don’t have to cook it. The sauce is very important when making a pasta bake, because it gives the pasta moisture to not dry out. My absolute favorite sauce is a simple classic tomato sauce. 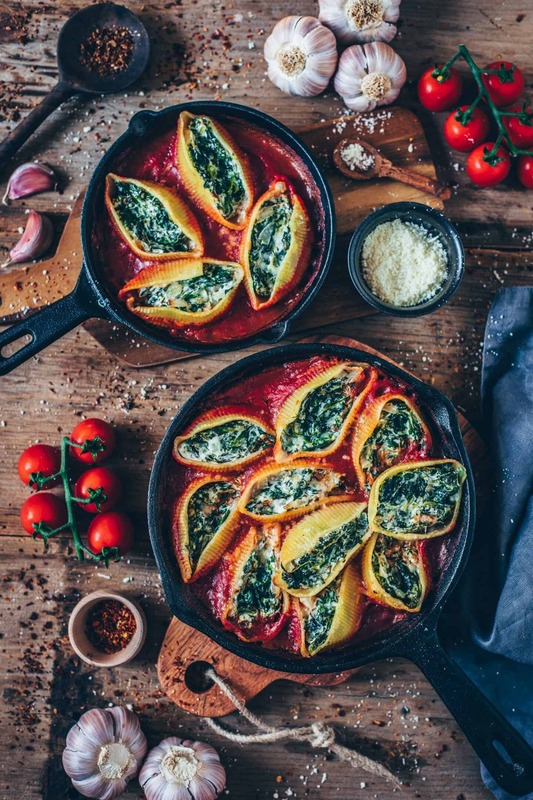 Not only because this sauce is so delicious but tomatoes are also healthy and rich in antioxidants. I usually prefer making my own tomato sauce, but feel free to use a store-bought tomato sauce. 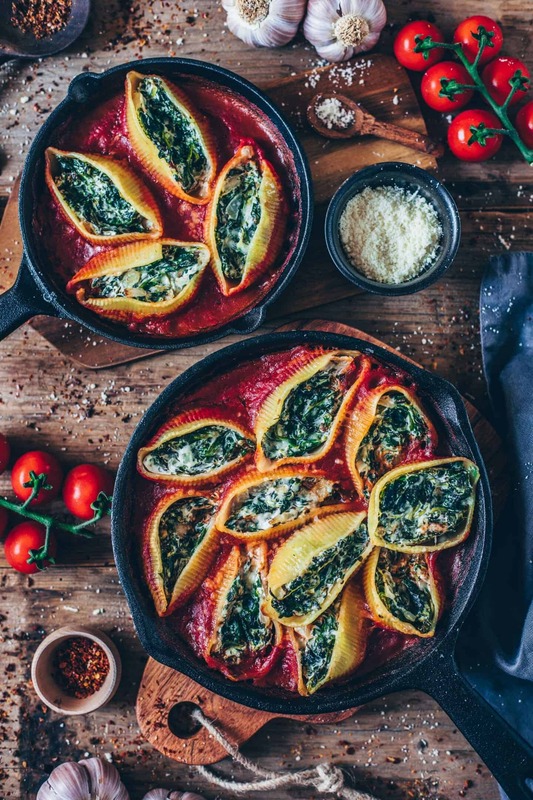 My homemade tomato sauce recipe is super simple, low-fat and a perfect addition to the spinach cream filling. It’s one of my most popular basic recipes and ready in just 5 minutes. 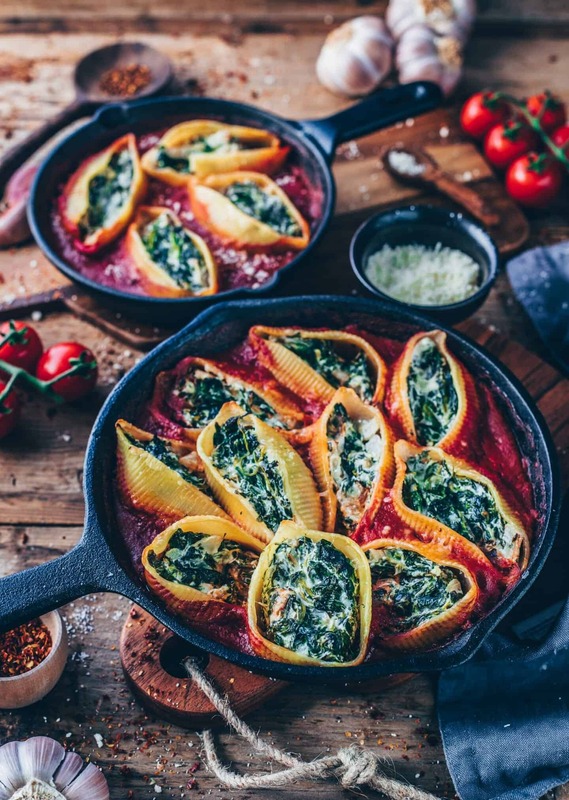 These Vegan Stuffed Shells are ideal for Food-Prep. To keep this recipe easier, I prefer cooking the pasta shells in advance (for example in the morning or the night before). Then you only need to combine all ingredients for the filling and fill your shells. 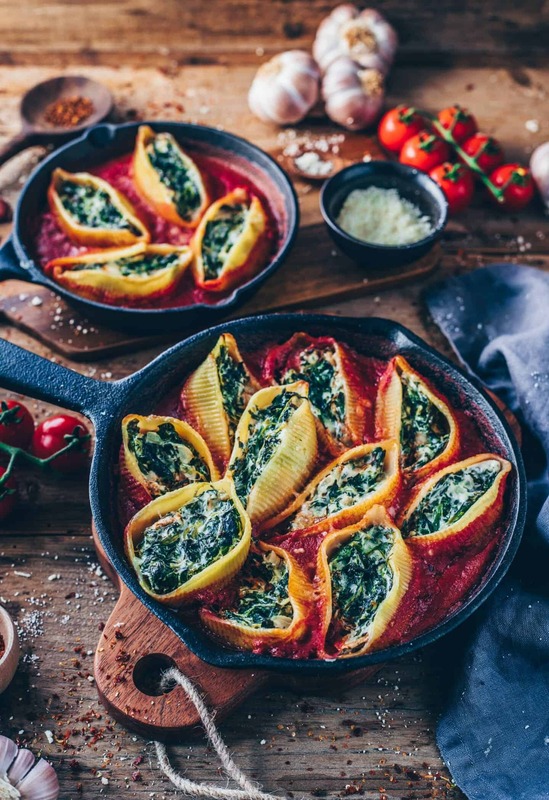 If you’re short on time, you could also make the filling in advance, so the entire dish will be ready to bake, when lunch or dinner comes around. I mean nothing’s better than coming home after a long day at work and not worrying about making dinner. If you’ll have any leftovers, you can store them covered in the fridge and reheat in the microwave the next day. Spooning some extra tomato sauce on top helps to keep them fresh. A creamy spinach filling is definitely my favorite from all existing fillings. 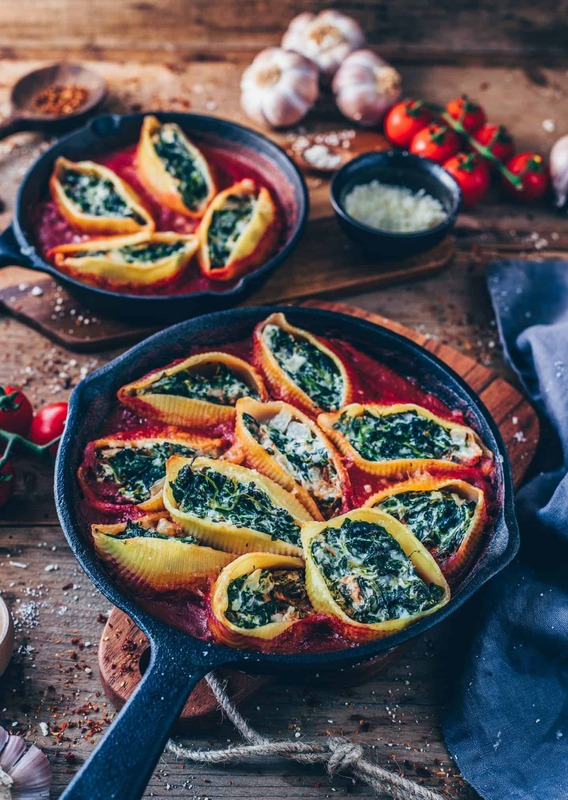 That’s why I love to add this combination to different recipes, such as my Dumplings, Empanadas, Croquettes, Spinach Wraps and much more. However, if you prefer to add any other vegetables, cheese/ cream/ sauce and flavors, feel free to get creative. You can vary the filling and sauce to your wish. Anyways, I love recipes which are so versatile. Are you with me? 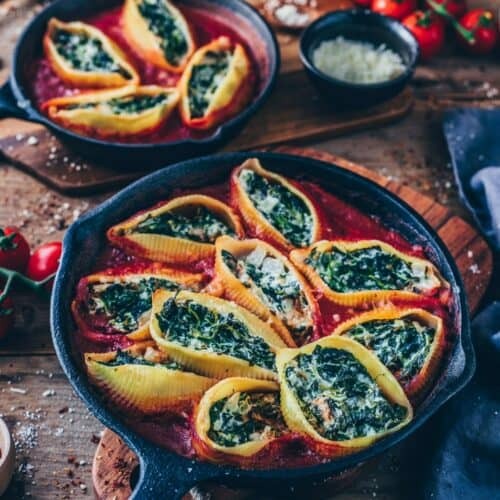 These Vegan Stuffed Shells filled with Spinach and dairy-free Cream is such a great comfort food, which is plant-based and healthy. It’s incredibly delicious, creamy, flavorful and easy to make. Cook the pasta shells according to the packaging instructions until al dente. Drain and set aside, afterwards. Briefly fry onions and garlic in hot oil until glassy and lightly browned. Stir in the tomato paste and tomato passata. Add oregano, salt, pepper and sugar to taste. Cook for about 5 minutes on low heat, stirring occasionally. Then fill the tomato sauce in a baking dish, so the buttom is covered. In the meantime, fry onions and garlic until glassy and lightly browned. Squeeze drained spinach with your hands to remove excess water and chop roughly. Mix with dairy-free cream cheese and fried onions + garlic. Season with salt, pepper and a splash of lemon juice to taste. Spoon the spinach cream mixture into the cooked pasta shells. 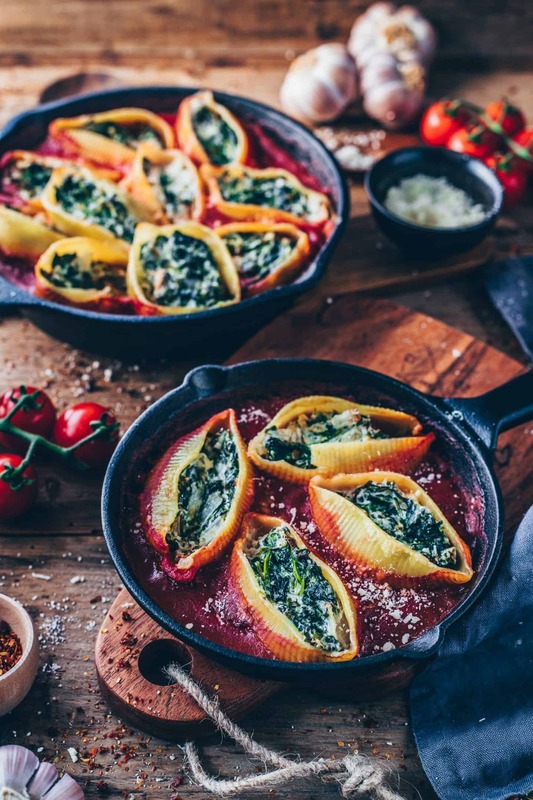 Place the stuffed shells in the baking dish on top of the tomato sauce. Optionally, sprinkle with vegan parmesan cheese. Bake for approx. 25 minutes at 355°F (180°C). Leftovers can be stored covered in the fridge but they’re also ideal for freezing. Spooning some extra tomato sauce on top helps to keep them fresh. If you’re short on time, you can simply use store-bought tomato sauce instead. To make your own vegan cream cheese check out this recipe -> "Cashew-Ricotta". 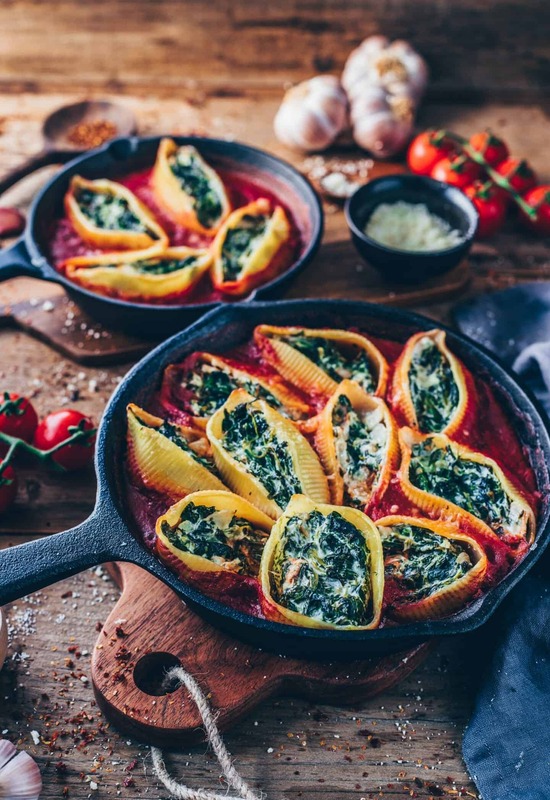 Diese Pasta Shells sehen ja unfassbar lecker aus, Bianca! 😍 Was für eine tolle Füllung! 😍 Das muss ich unbedingt mal ausprobieren. This recipe is definitely a keeper. Great comfort food for a chilly autumn night. I added mushrooms & used ricotta instead of cream cheese. Love it! Thanks for sharing this wonderful recipe Bianca.